Imbert Japan will attend the FABEX 2018 which is one of the largest tradeshow in Japan. The event will be held at Tokyo Big Sight between April 11th ? 13th. 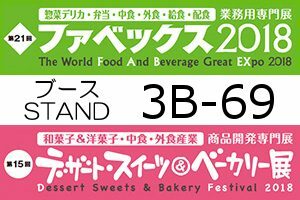 Our booth number [3B-69] is situated in the “Dessert Sweets & Bakery Festival 2018″ area , East Hall No:3. Please come and visit our booth! We will welcome you from 10am to 5pm for 3 days. Copyright© 2018 Imbert Japan Co., Ltd. All rights reserved.